Have a look over Full Tilt Lobby and just below of that find – How to Navigate Full Tilt Lobby? 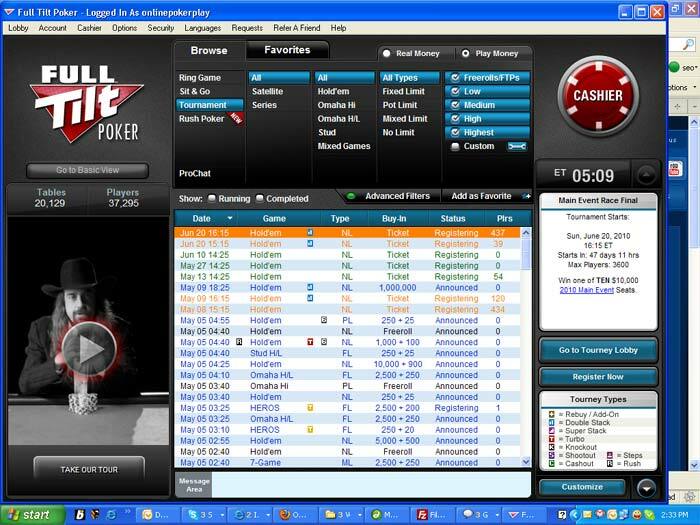 At the top left of Full Tilt Poker lobby, there is Full Tilt Poker logo, with an option for "Go to Basic View". Basic view is an alternate lobby view, but here, you will learn how to navigate the standard view of Full Tilt Poker Lobby. At the bottom left of the lobby, there is a video of Chris Ferguson explaining the standard view of full tilt poker lobby. At the top-center of the lobby, there is a "Filter", which lets you to narrow the huge range of Full Tilt Poker Tables, which are listed at the bottom-center of the Full Tilt Poker lobby. Also, you will see an advanced Filters button, which serves even more filters. At the top right of the lobby, you will see a Cashier button, and right below that, there is a clock that displays you the local time. The other portions of the right side of the Full Tilt Poker Lobby include the Player List, which show you the usernames and chip stacks of all the players at a highlighted table. On the bottom right, you will see a "key" for the lobby, which display the logos for Ante, Cap, Shallow Stack, Deep Stack, Educational, Speed, or Rush Poker tables. Cashier button is used to manage your funds, tracking your bonus and player points and making deposits and withdrawals at Full Tilt Poker. By using the Filter Function of Full Tilt Poker, you can choose the type of poker game that wish to play on the left, and keep on moving until you have find out your preferred Full Tilt Poker game. For example, if you click the “Ring Game” from the first section of Full Tilt Poker Filter, then you will see five variants of online poker game on the left. Namely, Hold’em, Omaha Hi, Omaha Hi/Lo, Stud and Mixed Games. Suppose you have chosen Hold’em, then you will find a list of all types of Hold’em on the left. Namely, Fixed Limit, Pot Limit, Mixed Limit and No Limit. Now suppose, you have selected No Limit Option of Texas Hold’em, then you will see following stakes options on the left: Low, Medium, High, Highest and Custom. Click your preferred stake option. Now a complete list of available poker tables related to that type of stake will be displayed below. Click your preferred table, and start playing your favorite online poker game. Once you have used the basic filter, there still may be fifties or hundreds of poker table list. In that case, use Advanced Filter option to find out tables further until you have a manageable amount of poker tables. To activate the Advanced Filter, select your basic filter options and click Advanced Filters at the bottom of the filter section. Table Listings of Full Tilt Poker Lobby display different table statistics of each Table listings. For example, Name of Poker Table, Type of Stakes, Size of Stakes, Number of Players, Waiting options, Average Pot, Average Flop and players and hands/hour. Using these poker table statistics, you can find the best suitable poker table. Remember: Always prefer a table having a big average pot size, a high percentage of players/ flop and a high hand/hour number.